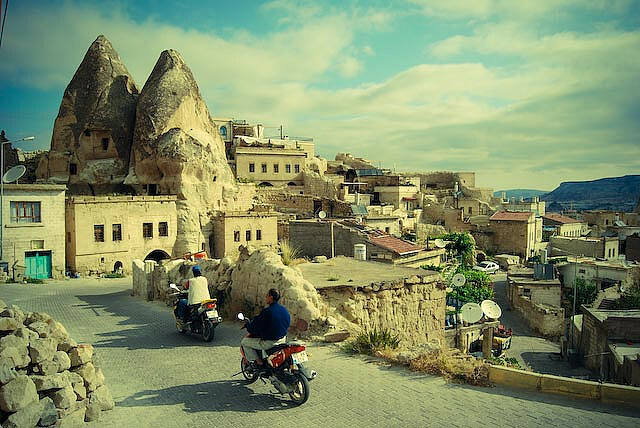 Turkey is well known to be the cultural meeting point between east and west. The weather in Turkey is also a meeting point for a number of distinct climates and weather patterns. Temperatures in Turkey vary from season to season and from region to region. There are four main climate zones in Turkey: the coastal areas along the Mediterranean and Aegean Seas, such as Izmir and Antalya; the eastern regions bordering Iraq and Georgia, such as the town of Karakose; the northern region along the coast of the Black Sea, including Istanbul, Samsun and Trabzon; and the central part of Turkey, which spans central Anatolia and encompasses Ankara. The coastal areas along the Mediterranean and the Aegean Seas enjoy Mediterranean climates, characterised by cool, wet winters and hot, dry summers. These coastal regions are popular with tourists during the summer period from the end of May to September, particularly during July and August – but be wary as peak summer is also peak mosquito season! However the low season along the Aegean and Mediterranean coasts of Turkey turn the small towns and even larger holiday resorts into ghost towns. The coastal towns close to Syria, but along the Turkey’s Mediterranean coast tend to have more of a hot middle-eastern climate than a Mediterranean one. The climate in the Aegean region of Turkey is great throughout the year, even during European winter. The weather in the eastern region of Turkey, bordering Georgia and Iraq, has hot summers and icy winters when snow often making towns and areas inaccessible. The climate in Turkey along the eastern part of the country is best enjoyed in late spring (from April to May) or early autumn (September to early October) as the weather in peak summer can become incredibly hot at times. Turkey’s climate and weather along the coast of the Black Sea is a continental climate. The fours seasons are very distinct and in summer the cities and towns bordering the Black Sea are inundated with tourists and holidaymakers eager to enjoy the summer weather. Humidity levels can be quite high during summer in northern Turkey. The peak season along the Black Sea Coast falls during mid summer in June, July and August. However, the coast is equally enjoyable in Spring and Autumn, in April, May, September and October, especially as there are less crowds during this time and the weather is comfortably mild. The weather in winter, particularly December and January, is cold and temperatures can drop below zero. The weather in Turkey’s capital, Ankara, as well as the central Anatolian region is severe. Winters are extremely cold with lots of snow, while summers tend to be incredibly hot and dry. Central Turkey’s climate is known as a mixture between a continental climate and a steppe climate. Day and night time temperatures vary considerably regardless of the season. The winter weather in December, January, February and March in Anatolia is an unfavourable time to visit the area as cities become snowed in and temperatures remain below freezing. The summer temperatures, in June, July and August, tend to be quite high, making spring and autumn the most favourable times to visit this beautiful part of Turkey. Packing for a holiday in Turkey relies heavily on the time of year and the particular region or regions of Turkey that you will be visiting. Winter weather in Turkey is particularly cold throughout the central Anatolian region as well as along the eastern part of the country. Warm clothes and snow resistant shoes are strongly advised. Winter along the Aegean coast particularly, but also along the Mediterranean coast, is mild but sometimes wet. Some warm clothes will be needed and a raincoat is essential. Spring and autumn are more pronounced along the coast of the Black Sea in Turkey, weather in this part of the country is mild and particularly comfortable at this time. Holidaymakers flying to Turkey in spring or autumn should pack a mixture of clothes and dress in layers that you can peel off as the day progresses. Summer temperatures in Turkey range from mild to hot throughout the country. Holidays on Turkey’s coasts require beachwear and light clothing such as linen trousers, t-shirts, skirts, hats and sunglasses.